Microorganisms are the main source of biocatalysts and with metagenomics approach it is now possible to overcome the major obstacle of microbiology which lies on the inability of the vast majority of microbes to grow under laboratory conditions. 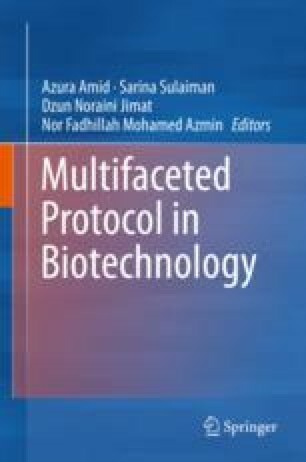 This chapter introduces and guides readers to a molecular biology approach that is useful for bioprospecting of novel, efficient and specific enzymes without escaping any unculturable or difficult to culture microorgaims. The first and necessary step of functional metagenomics is the metagenomic DNA library construction. It consists of metagenome extraction from the desired habitat, shearing of the DNA into sequences of desired size, end-repairing and cloning of these DNA sequences into a large-insert and high-copy number vector such as pCC1FOS with EPI300T1RE. coli as surrogate host, to the final step of storing the clones in glycerol stock for long term storage. Enrichment pre-DNA extraction step may be adopted to increase the likelihood that metagenomic DNA libraries hold the genes for the desired enzymatic activities.